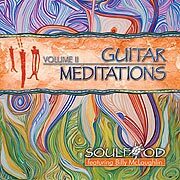 SOULFOOD’s DJ Free and Billy McLaughlin continue the success of their best-selling, critically acclaimed release Guitar Meditations. Billy’s multi-dimensional guitar and SOULFOOD’s rich soundscapes and lush keyboards create serene, peaceful music that speaks to the heart. Joining this collection are acclaimed finger style guitarist Dan Schwartz and Emmy® winning guitarist Ron Cohen.